“Wanna know how many bacon things I ate?” Rylee said, her wide eyes daring me to ask the question. Now, there is no way that Rylee managed to eat that many mini bacon-infused scones, but her enthusiasm certainly is a wonderful tribute to one of our fine country’s favourite foods. We learned that weddings are made more memorable when Granddad gets drunk off vodka-soaked gummy bears. Rylee has lost her two front teeth and looks like a champion. We met a baby with awesome hair. Vodka-soaked gummies are pretty much the best thing ever. Homemade marzipan is something you do only once. Chantelle can single handedly make you love Martha Stewart again. Our cake to vegetable ratio is sometimes extremely skewed. I don’t need to tell you in what direction. More recipes should call for high quantities of jam. Kim is officially Queen of Hats. Obviously we’re leaving it to her to make her own crown, because it’s certain to be better than anything we come up with. That is one big tomato. A huge thank you to Kim for hosting us, and for everyone for bringing their amazing creations. Here are a collection of said goodies. Scroll to the bottom for details of our next meetup and also some ideas for future themes! Tracy’s Berry and Lemon Tarts. Look at how cute they are. They’re barely even there. You could eat four and hardly notice. Lory’s Rhubarb Sour cream Cookies. She tried to dub them “rustic,” but these cookies were soft and fresh and decadent, and would be brilliant with a nice cup of Earl Grey tea. Who makes homemade Battenburg Cake, carving wedges of sponge into submission? Kim does. With her OWN MARZIPAN. I also discovered that Battenburg makes an excellent breakfast cake. 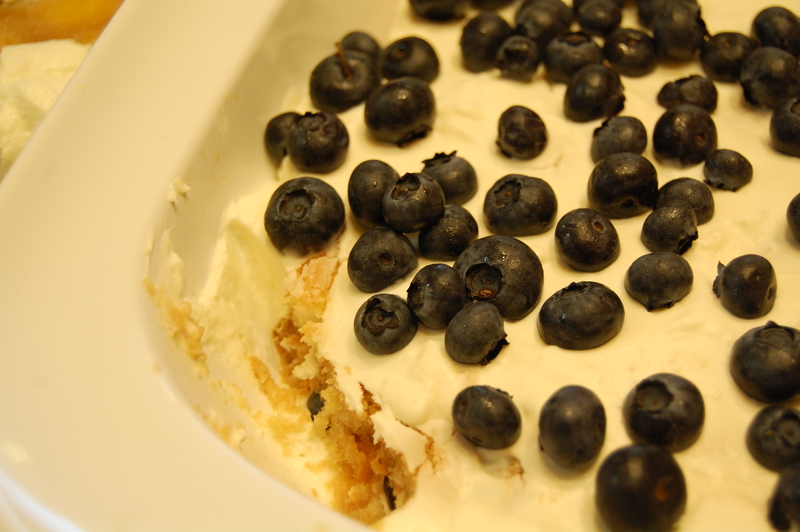 I took so many photos of Evelyn’s Blueberry Tart, but this is my favourite because I tell myself it is a sea of blueberries atop custard and pastry, going on forever. Sigh. 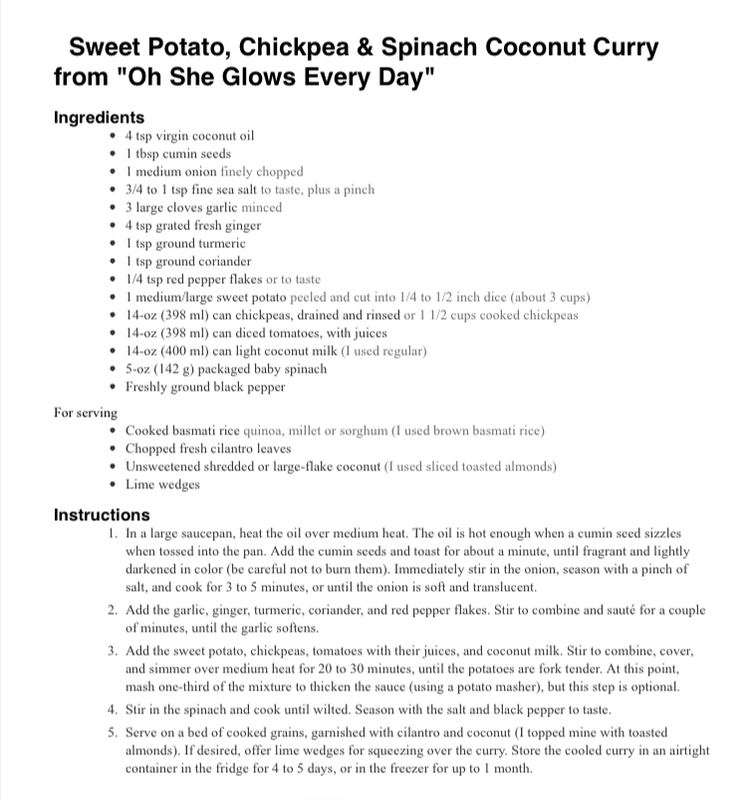 Charlie alone made certain we didn’t collectively fall prey to scurvy, with her beautiful, delicious and healthy! Bocconcini Salad. How cute are these!? 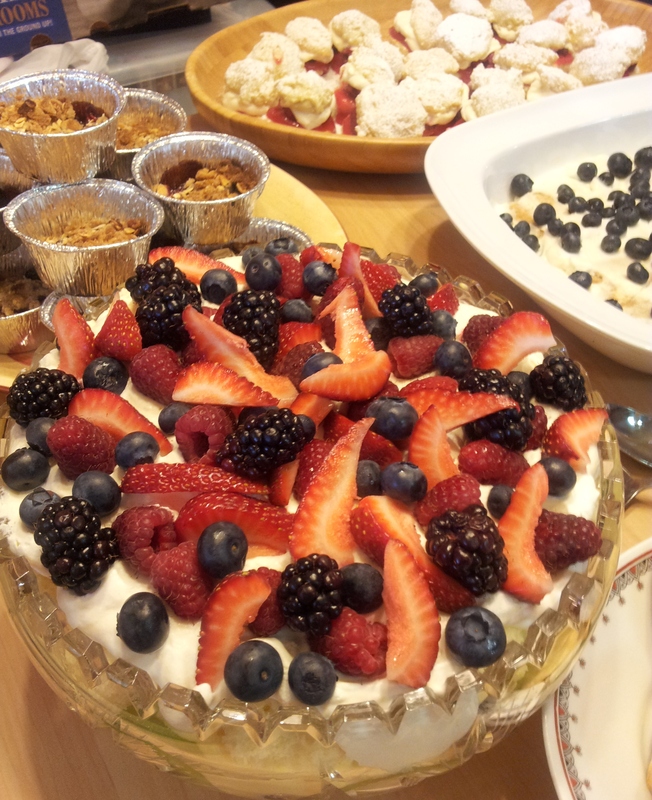 Inspired by Ms Martha, Chantelle created Potted Chocolate Puddings that are a luscious treat for a garden party. Or second breakfast. Before: Scones à la Lisa, with Bacon, Chives and Cheese. 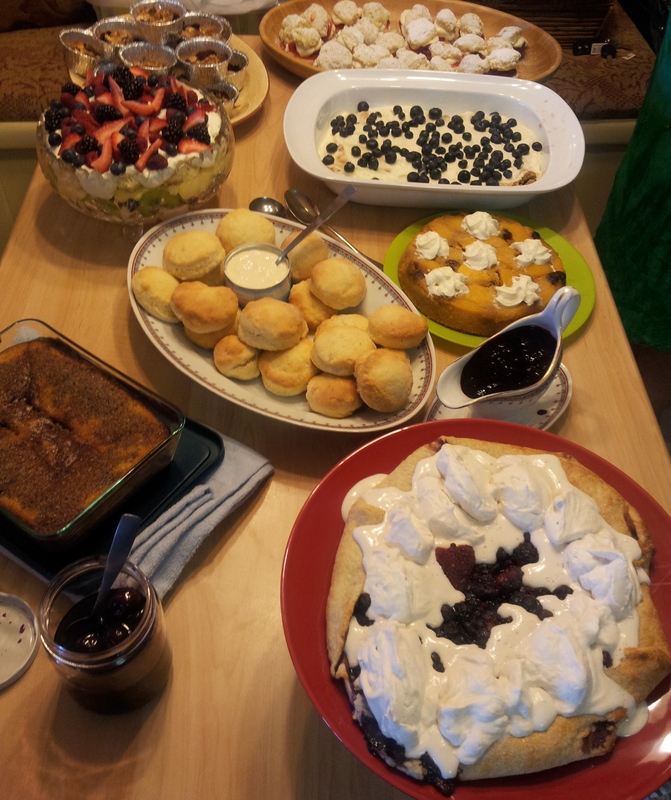 After: We ate all the scones. Because BACON. 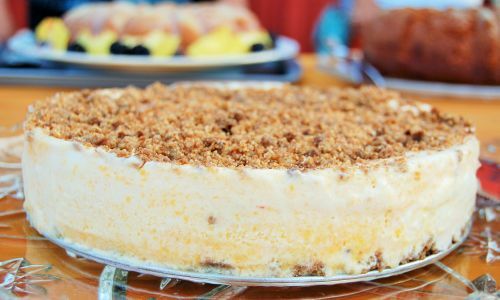 Janice’s Orange Chiffon Cake. You know when a cake is perfectly fluffy and you can tell that the whole “beat the egg whites to that magic vague texture that will make everything awesome” part of the cake making process must have gone really well? This cake was like that. So many of Jean’s bakes are so pretty, they look like they belong at a rather posh high tea, and her Raspberry Cream Cheese Coffee Cake was no different. I mean look at it – it’s daring you with its decadence. Here they are – Evelyn and Charlie’s Vodka Soaked Gummies. They were sooo good, I have thought about them everyday since our meetup. And they count as a serving of fruit, right? What you are seeing here is the base of Sharry’s Black Berry Trifle. What you don’t see is the bowl filled with a mountain of whipped cream, and a charming bowl of roasted slivered almond to top they whole thing off. And she made HOMEMADE CUSTARD! Sophia’s Lemon Cupcakes with lemon buttercream. I had meant to make angel food cake, but somehow misplaced the whisk attachment for my kitchenaid. How does that happen? Evil Kitchenaid Attachment Fairies? Denise made her dreamy little Raspberry Cream Cheese Tarts in two different pastry shells, because she’s fabulous like that. Some of our clan got to have a tour of Kim’s garden, which is swoon-worthy and offers a rather grand view over Summerland and Okanagan Lake. Thursday, June 23 at Wendy’s! Thank you Wendy for hosting us! If you are attending, please email me for directions. Theme – “Free From 2.0” Many people have asked for another opportunity to experiment with gluten free/sugar free recipes, so here’s your chance! PLEASE RSVP – I like to give our host some idea of how many will be attending. If you’re coming along to this month’s gathering, please email me to let me know you’ll be there. I recently met a man who told me of a supper club he and his wife used to belong to. Like our little group they would have a theme every month, and one month their theme was “Food from around the world.” In order to decide who got what area, the month previous they had thrown darts at a huge map of the world. Not only could you land on a country, but you could land on a specific city in that country. Imagine getting Chicago or Milan, or Timbuktu. If people are interested I am happy to acquire a map and some darts, or devise some other internet-based, spin-the-wheel option. After our May gathering, Kim and I enjoyed a concentrated discussion that had nothing to do with baking club meet ups but a lot to do with the apocalypse preparedness, both emotionally and in practical terms (it was a hell of a 15 minute conversation), and we thought it would be fun to indulge in an apocalypse-inspired recipe theme. I’m thinking this could be an entertaining one for the winter months. You could choose to inspired one of two ways with regard to recipe choice. 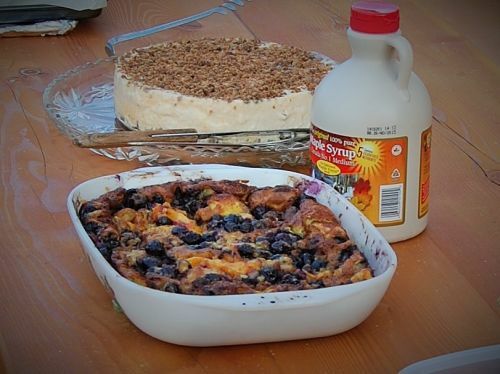 Bunker Basics- practical dishes for subsistence living. Last Meal Merengue: The comet is coming and I’ll be damned if I’m eating Kraft Dinner. What do you think? It’s our eating club and we can be as silly as we like! Leave a comment below or ship me an email. August meetup report & recipes! Before I launch into the photos and general deliciousness that was last month’s gathering, here are the need-to-know details of our September meetup! 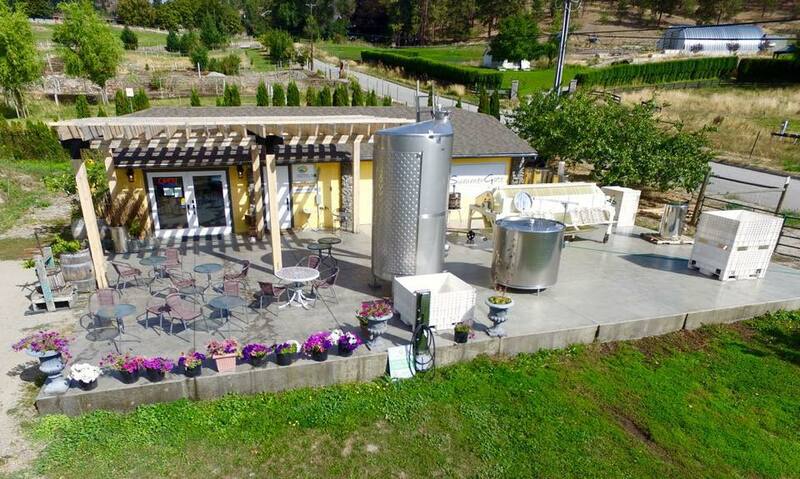 SummerGate Winery, where we’ll be spending our time on September 27! Theme: Harvest and Herbs. Many of us are garden rich at the moment, so use what you’re harvesting and throw in some herbs to make it extra fabulous. This is potluck style, so it can be baked or not -whatever you choose! What to bring: Other than your offering of tastiness, there will be the opportunity to buy some glasses of wine to enjoy with our meal, so bring a few dollars so you can treat yourself. SummerGate is a unique, small organic winery with amazing white wines that are definitely worth sampling! Let me know if you’re coming along! Email me at pleasebringcake@gmail.com so I can give the lovely folks at SummerGate an idea of numbers. On with the August treats! One could say we ate a few peaches at August’s meetup. Seeing as our theme was Orchard Fruit and our meeting place was The Peach Pitt, we were pretty bang on, if I do say so myself. A HUGE thank you to Sandy at The Peach Pitt for hosting our wee clan of foodies! I don’t have all the recipes so I’m going to try in intersperse recipes with glorious photos over which you can drool. Let’s begin! I confess that I ate more than my fair share of these darling little explosions of flavour, sweetness smoothed by a layer of cheese. Seriously, I think I had five. I don’t even feel bad – they were that good. Peel and roughly chop the peaches. Mash the peaches and measure 5 cups. Add the peaches and lemon juice to a medium saucepan. Slowly stir in the pectin. Bring the mixture to a hard boil that can’t be stirred down. Stir in about 3 cups of sugar until dissolved. Return to a hard boil and boil for 1 minute, stirring the whole time. Remove from heat and skim foam off of the top. Stir in 1/2 cup torn basil leaves. Can or cool and store in fridge. Okay so I had two slices of this as well, but technically I only had 1 1/2, since half of my first serving was blown away by a gust of wind. Also, can I just say how impressed I was by how much of this we managed to demolish before it started to melt. Reserve about 3/4 c. of the crumb mix for the topping. Spread remainder in 9″ springform pan or 9×13″ baking dish and set aside. Mash the peaches really well (I used the food processor) Add sugar and lemon juice. Beat egg whites until foamy and then on high speed to get them almost double in volume. Add the peaches (I had to cover my Kitchen Aid with a tea towel at this stage, cuz it makes a real mess) Whip this until it is double in volume and the mixture is thick. Takes about 10 minutes. In the mean time, whip the cream in another bowl, then fold it into the peach mixture gently. Pour into springform pan, sprinkle with remaining crumbs. Cover and freeze for at least 6hr. of overnight. Transfer to fridge about 30 minutes before serving. (The next bit is serious because Jean wrote it in capitals) DON’T FORGET TO CLEAN YOUR KITCHEN. I FOUND THE MIXTURE EVERYWHERE, INCLUDING THE WALL BESIDE THE MIXER EVEN THOUGH I COVERED IT COMPLETELY WITH THE TEA TOWEL!!!!! There were absolutely zero leftovers of this lovely creation. Click the link for the recipe! Melt 3 tbsp. 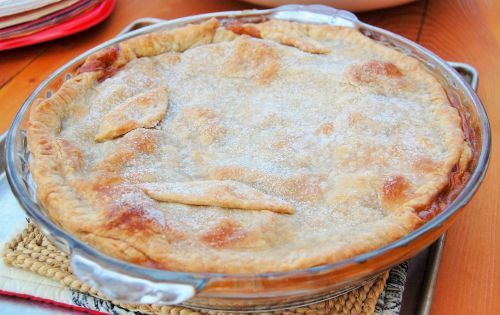 butter in glass pie plate or baking dish, Add 3 large nectarines and blueberries, or apples, or pears, cook for 10 minutes at 425. 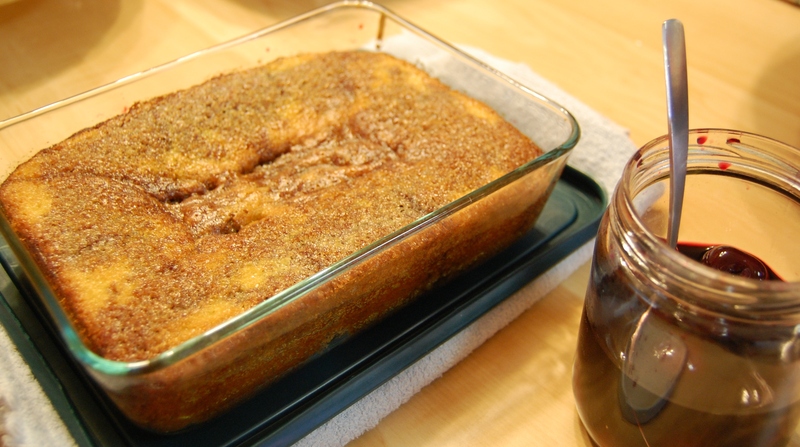 Top with 1/4 brown sugar and 1 tsp cinnamon. Pour batter over and bake another 20 mins or till brown. Enjoy warm with maple syrup if desired. (If desired, Janice? Or course we desire. Of course). The woman made her own baguettes, people! Virtual high fives for Chantelle! This is what happens when super cook Belinda misses a few meetups – she shows up with not one but two dishes! 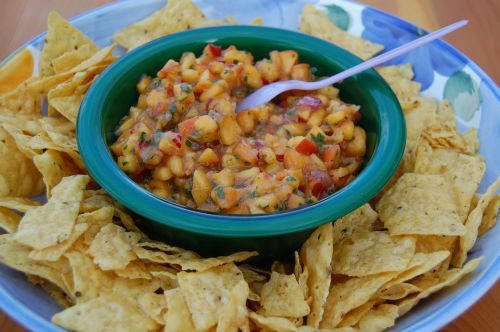 Now, Laura also made a scrumptious peach salsa, and I can’t remember who made which one, so you may gaze upon them each in turn. 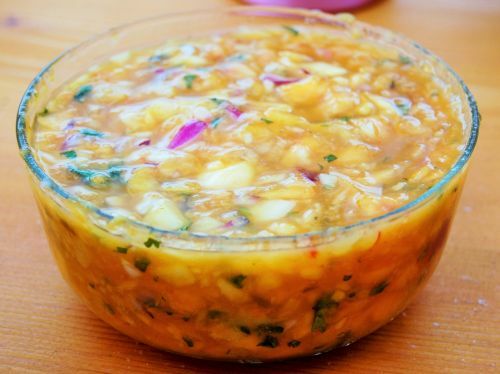 Dash of thai chili pepper sauce. 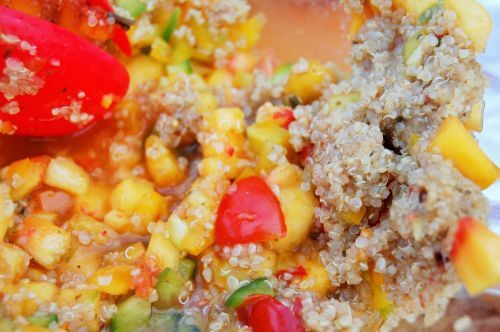 4 tbsp of Epicure Peach salsa seasoning. Let stand in bowl until all the liquid is absorbed. About 25 minutes. Peaches and peppers (Sliced in small pieces). Try red and yellow for colour. Cherry tomatoes quartered. May be nice with a little fresh cilantro on top (mine had already gone to seed). 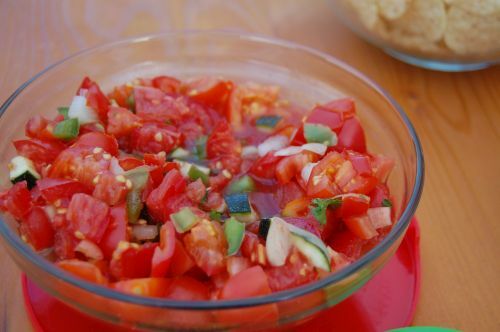 Every time I eat homemade tomato salsa, I swoon inwardly and think “I really need to make this.” And then I don’t make it. But oh my, was it ever good. This magnificent beast had dijon mustard, pears, and brie. I wasn’t fast enough and missed out on a slice, but it certainly looked divine. 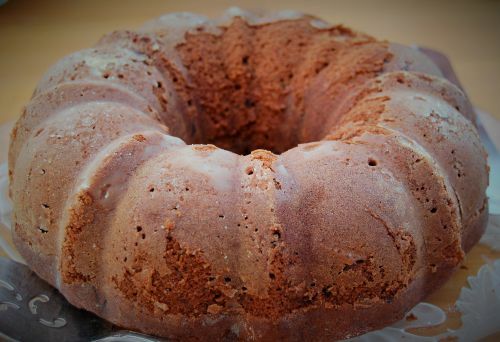 Who doesn’t love a bit of chocolate zucchini cake of a morning? Sorry – did I just give away that I ate some of this for breakfast the next day? Nevermind. Hey, there were vegetables in it – it was practically a low-fat scramble! 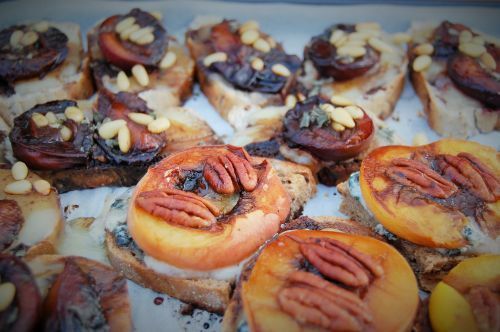 These little beauties were a complex combination of flavours, including plums, mozzarella, pine nuts and mint with a reduced balsamic vinegar on a blue cheese and pecan baton (and breathe), and roast peaches with pecans and brie on light rye bread. YUM! 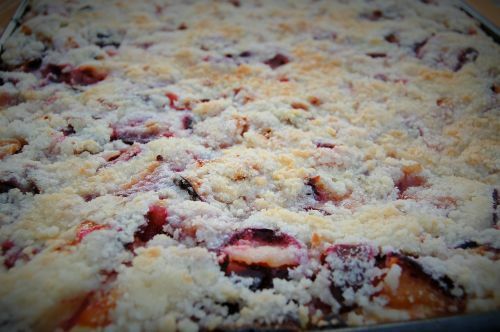 When you’re heading into autumn, you can’t really beat plum coffee cake. Give me a big slice and a nice latte and I’m perfectly happy, thank you. 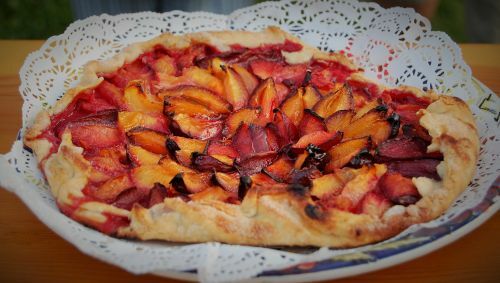 This is adapted from a recipe for apricot galette in Chez Panisse Fruit by Alice Waters. Combine flour, sugar, and salt in a large mixing bowl. Cut 4 T of the butter into the flour mixture with a pastry blender, mixing until the dough resembles coarse cornmeal. Cut in the remaining 8 T of butter just until the biggest pieces of butter are the size of large peas – or a little larger. Dribble 7 T of ice water into the four mixture in several stages, tossing and mixing between additions, until the dough just holds together (I used a fork). Do not pinch or squeeze the dough or you will overwork it. Keep tossing the mixture until it starts to pull together; it will look rather ropy, with some dry patches. If it looks like there are more dry patches than ropy parts, add another tablespoon of water and toss the mixture until it comes together. This makes about 20 ounces of dough, enough for 2 open galettes or tarts or one covered tart. Toss all the ingredients together. Makes 1 cup. This keeps for a few months in the refrigerator. 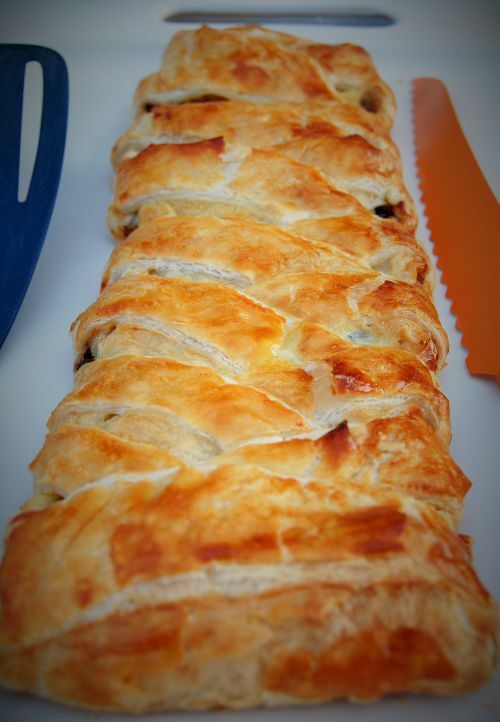 Remove the prerolled dough from the refrigerator or freezer and place on a buttered or parchment-lined baking sheet. Evenly sprinkle the almond-amaretti powder over the dough, leaving a 1 to 1-1/2-inch border unsprinkled. Cut the plums in half (or quarters if they are large), removing the pits, and arrange, skin side down in concentric circles on the dusted dough, making a single layer of snugly touching pieces and leaving the border bare. 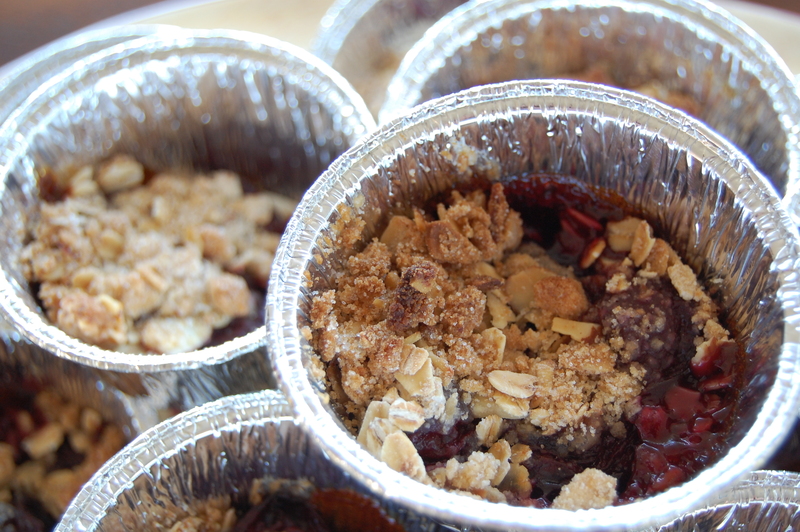 Evenly sprinkle ¼ cup sugar over the fruit. 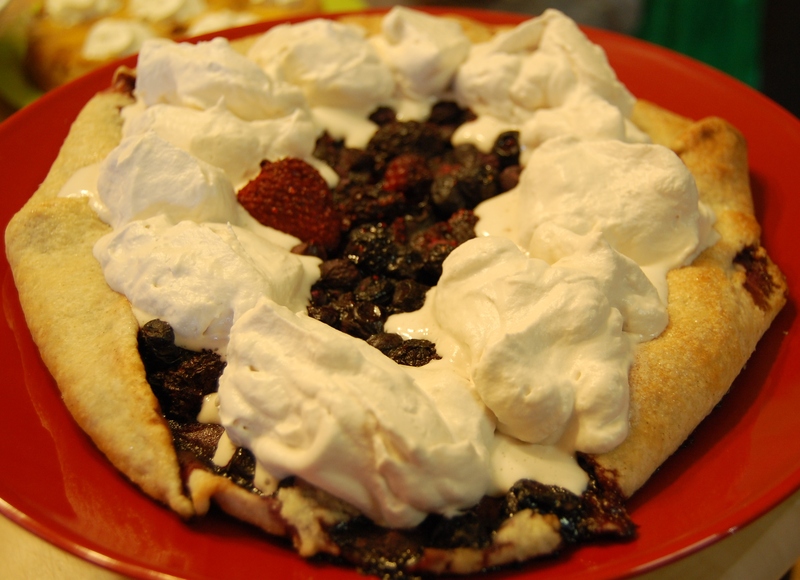 While rotating the tart, fold the border of exposed dough up and over itself at regular intervals, crimping and pushing it up against the outer circle of fruit, creating a containing rim that resembles a length of rope. Pinch off any excess dough. This rim must act as a dam, preventing juices from escaping while cooking, so make sure there are not folds or wrinkles that would permit such a breach. Brush the border gently with melted butter and sprinkle it with 2 T sugar. 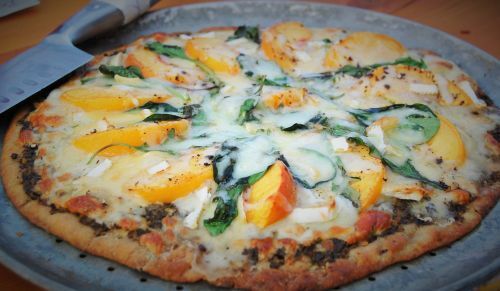 Bake in the lower third of the oven (preferably on a pizza stone) for about 45 to 50 minutes, until the crust is well browned and its edges are slightly caramelized. As soon as the galette is out of the oven, use a large metal spatula to slide it off the baking sheet or parchment paper and onto a cooling rack. This keeps it from steaming and getting soggy. Let cool for 20 minutes. If you want to glaze the tart, brush the fruit lightly with a little warmed jam. Serve warm, with vanilla ice cream, if you like. Makes 1 12-inch tart, serves 8. I almost forgot that I made something as well. 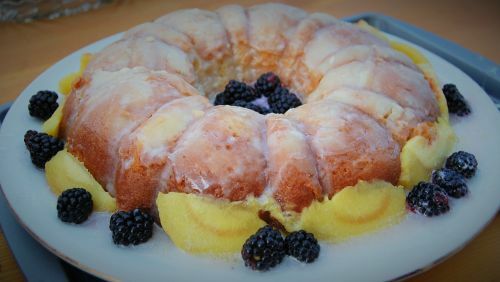 This recipe is from the Great British Bakeoff Book, and while I couldn’t find the same kind of sticky ginger that I could in the UK, I made due with candied ginger cut up fine and mixed with a bit of ginger marmalade. I swear, it tastes better than it looks. Preheat the oven to 375F. Rinse the fruit, then halve and remove the stones. Cut each peach half into 4 thick slices. Put into a mixing bowl with the lemon zest and juice and the sugar. Toss gently, then transfer to the baking dish. Spoon over 2 tablespoons water. 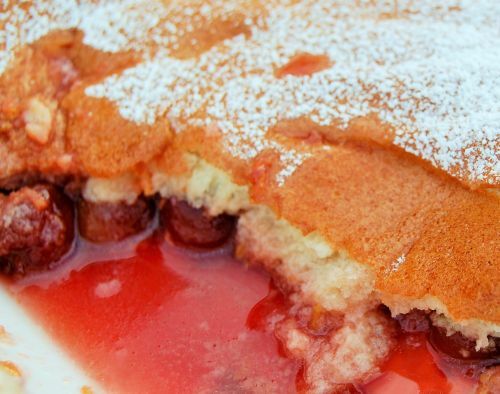 Bake for 20 to 25 minutes or until the fruit is half-tender and the juices are bubbling. Just before the end of the cooking time sift the flour, baking soda and sugar into a mixing bowl. Using a round-bladed knife stir in the chopped ginger, followed by the melted butter and yogurt to make a soft, sticky dough. Remove the baking dish from the oven and turn up the heat to 425F. Divide the dough into 8 equal portions and drop in rough mounds, slightly apart, on top of the hot peach mixture. Sprinkle the dough with the sugar and ginger mixture. Return to the oven and bake for about 20 minutes or until the topping is crisp and a good golden brown. 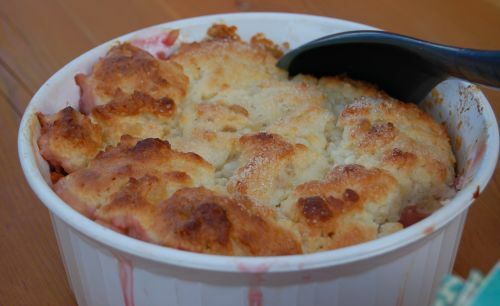 Serve warm with custard, cream or ice cream. 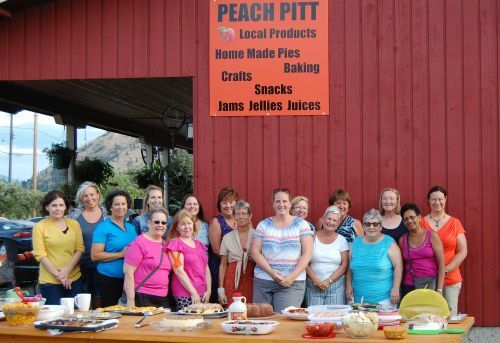 Living as we do in an area that is known for its agriculture, it seemed only fitting that the third meeting of the Summerland Bakers be dedicated to Seasonal Fruit. We had a great turnout (our biggest yet!) and the bakes were utterly swoon-worthy. The lovely Lorena and her mum were our hosts, and where better to spend an evening eating cakes than on a made-for-summer deck? Chandra’s buttermilk cake (secret recipe) with “boozy cherries” that had been soaking in rum for three weeks in the sun. Oh, yeah. Lorena’s mini cherry crisps. Not overly sweet and perfect with crumbly topping. 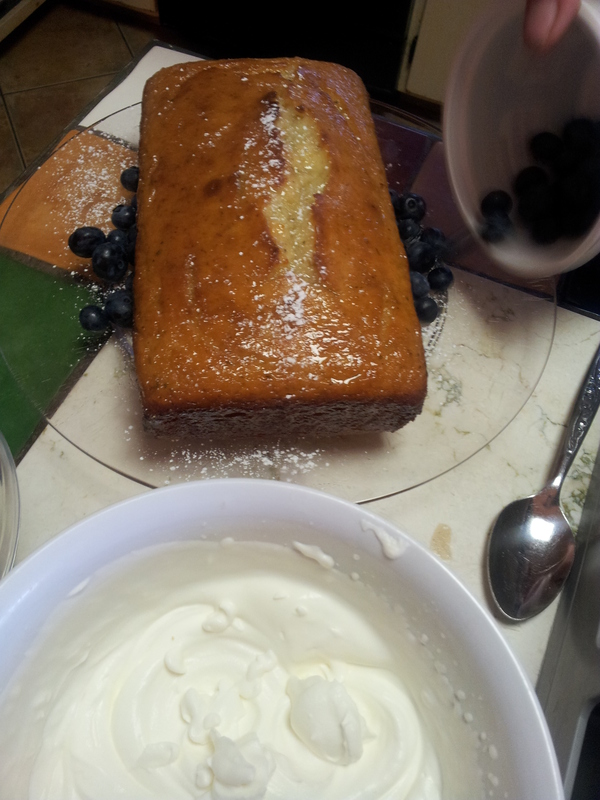 Dorthea’s Lemon and Thyme Cake with blueberries and blueberry compote, which also had thyme. The cake had no butter so it was very light. 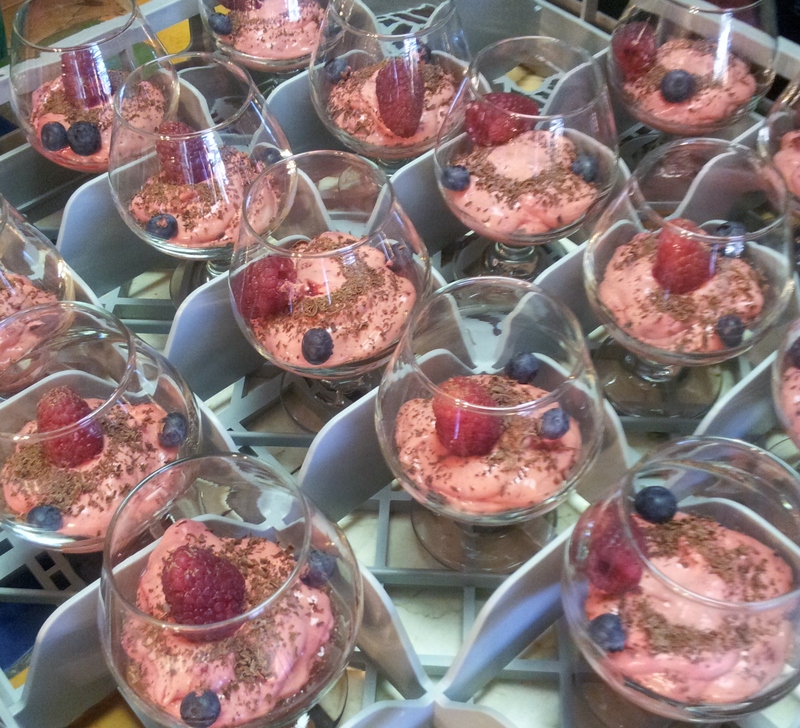 Lisa L filled brandy glasses with raspberry mousse, topped with chocolate shavings. Some of us may have eaten two. 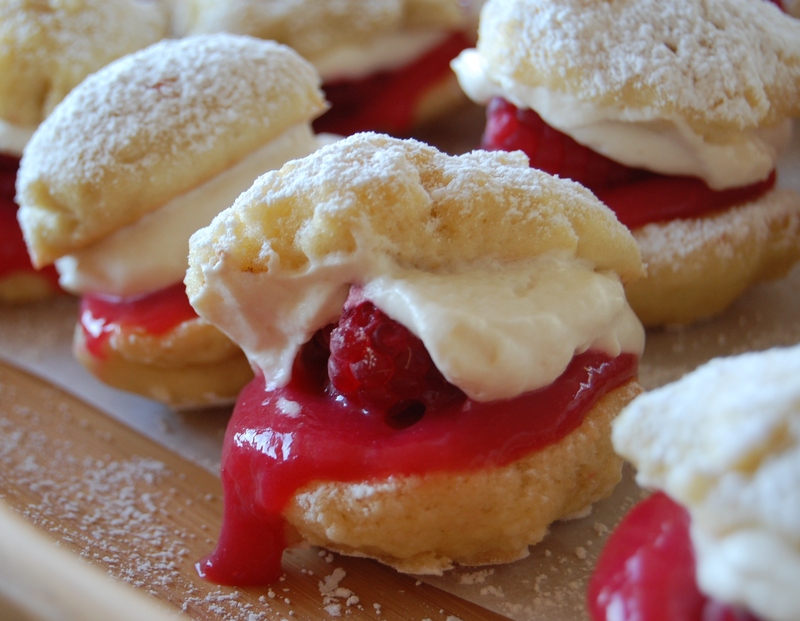 Sophia’s sponge drops with raspberry curd, fresh raspberries and cream. 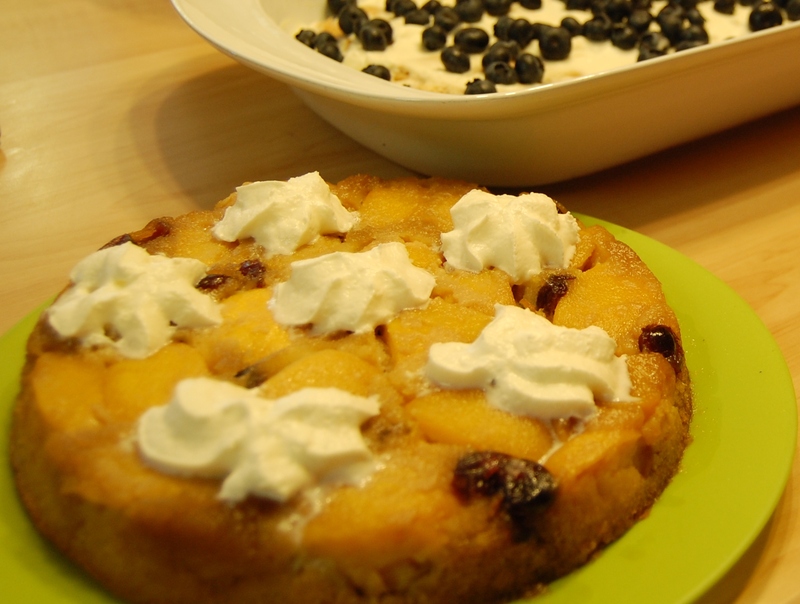 Janice’s very refreshing peach cake with cream. So moorish. 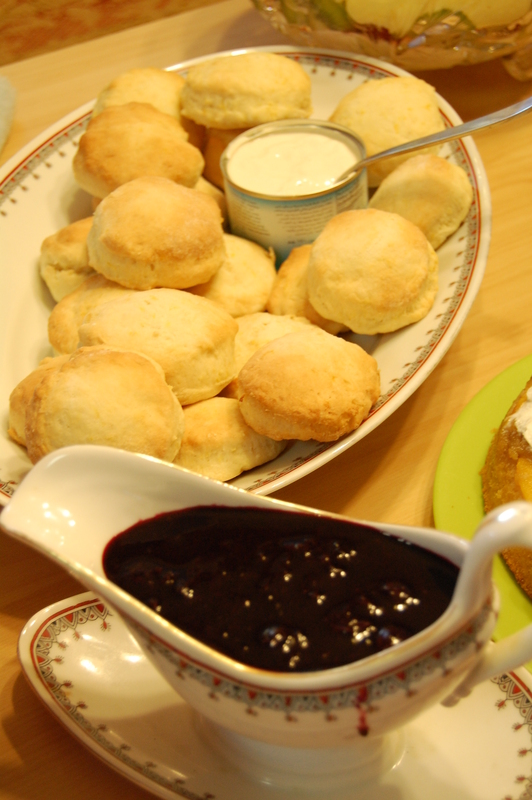 Jennifer’s lemon scones with blueberry sauce (with brown sugar, allspice and vanilla), and clotted cream. For our next gathering, we will be sticking with honouring our great growing season, but this time it will be “From the Garden.” So many options; caramelized onion tartlets, roasted tomato quiche zucchini muffins, beetroot and chocolate loaf…. The date for the next meetup is August 22. Want to attend? Email me at pleasebringcake@gmail.com to be on the mailing list.